The Healing Code, a new book by Dr. Alex Loyd (creator of The Healing Codes system) and Dr. Ben Johnson (the only medical doctor to appear in the movie “The Secret”), reveals a revolutionary six-minute process that heals the source of virtually all illness and disease, even success and relationship issues. Keep reading to discover more about The Healing Code and to claim some amazing free gifts we have for you. Did you know that one thing accounts for up to 95% of all illness and disease? It’s true! According to Harvard Medical School, Stanford University Medical School, the Mayo Clinic, the Centers for Disease Control and numerous other research centers, there is one source for up to 95% of all illness and disease. It’s NOT your thoughts, emotions, conscious beliefs, actions or even your DNA. Solomon revealed this source more than 3,000 years ago, and modern science has now confirmed it! Dr. Ben Johnson’s personal story below is just one of the thousands of stories of healing from people who have used The Healing Codes. In 2003, Dr. Ben Johnson visited an orthopedic surgeon to discuss symptoms of fatigue and muscle spasms he had been experiencing for over a year. The diagnosis was something he never expected…ALS (more commonly known as “Lou Gehrig’s Disease”). He then went to another doctor for a second opinion, but the diagnosis was the same. As a medical doctor, Ben knew his prognosis was grim. Eighty percent of people with ALS die within 5 years of developing symptoms, and he had been experiencing symptoms for over a year. Shortly after his diagnosis, Ben learned of Dr. Alex Loyd’s new work known as The Healing Codes. 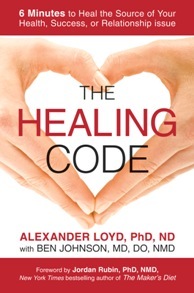 Ben was intrigued by the amazing stories of healing being experienced by Dr. Loyd’s patients, so he decided to personally investigate the science and philosophy of The Healing Codes. He came away convinced that there really was something remarkable in Dr. Loyd’s new work, and began practicing The Healing Codes himself. After only three months of practicing The Healing Codes, Ben could tell that he was no longer experiencing the symptoms of ALS. He returned to the surgeon who had first diagnosed him with ALS, and the tests showed that the disease was 100% gone. Ben has remained symptom free for over 6 years now! After personally experiencing the results of The Healing Codes techniques, Ben has traveled all over the world telling people about The Healing Codes. Just as Dr. Ben Johnson experienced healing of his ALS using The Healing Codes, literally thousands of people using The Healing Codes have experienced healing of issues such as diabetes, migraines, depression, cancer, back pain, addictions, insomnia, hemorrhoids, scoliosis, and much, much more. The Healing Codes have also successfully been used to resolve virtually all kinds of relationship issues and success issues. Based on their combined research and experience, Dr. Loyd and Dr. Johnson have teamed up to bring you their new book, The Healing Code. In this revolutionary book, Dr. Loyd reveals a “Universal Healing Code” that will successfully heal virtually any issue for the vast majority of people….whether the issue is physical, emotional, relational, or success oriented. Bonus # 1 Heart Issues Finder – The only assessment of its kind in the world that identifies your source issues and gives you a 10-15 page personalized report pinpointing the issues you can use The Healing Codes to address. Bonus #2 “The Seven Secrets to Life, Health, and Prosperity” – VIDEO – In this video Dr. Alex Loyd and Dr. Ben Johnson shares these seven secrets on which a portion of this book is based. Bonus #3 “Personal Tracking Form” for you to use and record your healing journey. Bonus #4 “Sample Truth Focus Statements” in the Twelve Categories to help you do The Healing Codes. Bonus #5 Monthly editions of “Life or Death:The Secret Spiritual Laws of Nature” newsletter from Dr. Alex Loyd sent to you via email for a full year. Get your very own copy of the bestselling book as well as more than $200 in free gifts by clicking the Order Now button now. As seen on PBS, TBN, Network and Cable Television, as well as #1 Amazon Bestseller in 8 categories: General, Health, Mind & Body, Alternative Medicine, Psychology & Counseling, Counseling, Self Help, Stress Management, and Religion and Spirituality.